Imagine we have a square coaster upon which we place a hot mug of tea. We wish to model the distribution of temperature across the coaster over time. 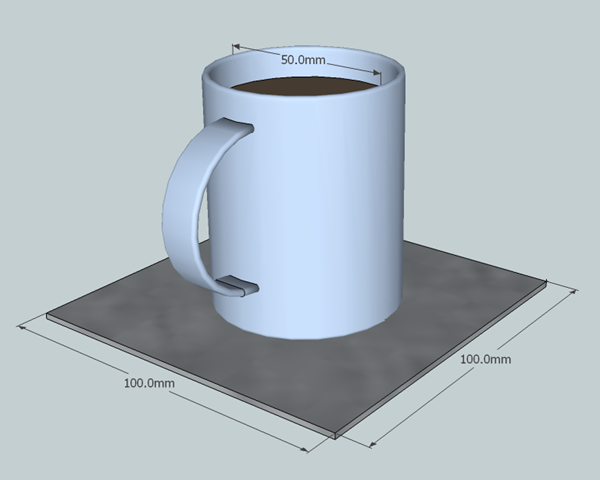 For the sake of simplicity we will model the coaster only in two dimensions and we take the initial temperature across the surface to be except for a circle where the rim of the bottom of the mug touches the coaster, at which the temperature is . In this post I’m going to show how we can model the heat equation succinctly in F#. I’m going to consider the two-dimensional case and approximate the solution at discrete spatial mesh points and at discrete time periods. We will also plot the results by mapping the temperature onto the brightness (i.e. a heat or intensity map). where represents the temperature at time and at coordinates . To model this in F# we are going to represent the surface of the coaster using a 100×100 matrix (the matrix class is included in the F# powerpack). For some constant which represents the thermal conductivity of the surface. Note that here is a natural number representing discrete time values. The F# code runs very close to the mathematics so it should be self-documenting (although I’ve added some comments for readability). Plotting the results is relatively straightforward: we normalize the temperatures and represent them as shades of grey, white being hottest and black being coolest. Here I have taken snapshots at discrete times 0, 50, 100, …, 1000 with . Quite an impressive simulation for just 100 lines of code – including comments and white space! Parallel Numerical Solution of 2-D Heat Equation, Verena Horak and Peter Gruber.